The “Ten Steps to Successful Breastfeeding” is a 1989 joint statement from WHO and UNICEF on which the Initiative is built. The Baby Friendly Health (Hospital) Initiative is a “package” of criteria, standards, audit tools, external assessment including interviewing of staff, mothers, observations and document review, that expands on the practices briefly listed in the “Ten Steps” statement with additions and updates since 1989. For example, the original “Ten Steps” statement does not mention babies who are not breastfed wheras the Initiative includes all babies and their mothers; the Initiative includes supportive birth practices though these are not mentioned in the “Ten Steps” statement. The International Code of Marketing of Breastmilk Substitutes (and subsequent related resolutions of the World Health Assembly) is included in the Initiative “package” though not specifically mentioned in the “Ten Steps”. This difference means that a hospital could say that they implement the “Ten Steps” because these 10 practices are listed in the hospital infant feeding policy, but this does not mean there has been any external assessment that these practices are actually occuring. The external assessment and monitoring that are part of the Initiative "package" help to protect babies and their mothers as well as provide staff with clear measurable practices and standards. 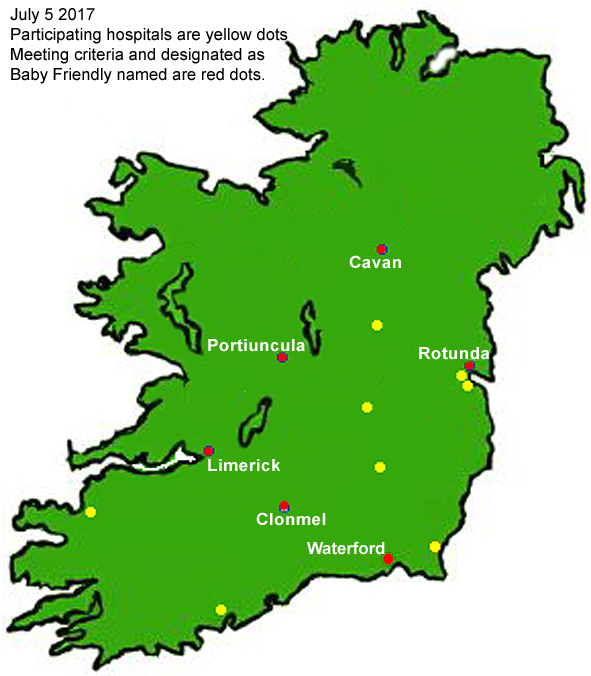 What is the Baby Friendly Health Initiative in Ireland? The Baby Friendly Hospital Initiative (BFHI) is a global campaign by the World Health Organisation and the United Nations Children's Fund (UNICEF) which recognises that implementing best practice in the maternity service is crucial to the success of programmes to promote breastfeeding. The Baby Friendly Health Initiative in Ireland (BFHI) is active in Ireland for 19 years providing consistent evidenced-based information, capacity building, support, and monitoring of standards towards assisting health facilities to implement and sustain an environment that routinely provides breastfeeding supportive practices towards lifelong health and wellbeing. It also provides an independent external assessment process for health facilities seeking designation under the WHO/UNICEF Baby Friendly Hospital Initiative. These existing standards and monitoring process can be used as part of related performance indicators and systems. When the BFHI in Ireland began it was a part of the Health Promoting Hospitals programme. It is now an independent organisationand meeting the requirements of the charities regulatory authority. The title changed in Ireland in 2013 from Baby Friendly Hospital Initiative to Health initiative to allow for expansion of the effective programme to include the broader health service settings that might become part of the Initiative in the future. The BFHI in Ireland model has always been an inclusive model including the global baby-friendly practices as sustainable routine practice in all maternity units rather than situating designation as a Baby Friendly Hospital as an optional extra for a few maternity services. The Initiative is much broader than only promoting breastfeeding or increasing breastfeeding rates. Supporting mothers is about helping all mothers to feed their baby the way that they want to, and so that mothers do not have to stop breastfeeding when they want to continue. Practices of the BFHI include appropriately skilled staff, informed parental decisions through the provision of appropriate and accurate discussions, supportive labour and birth practices, early and continued mother-baby contact, and feeding skills, for all babies and their mothers regardless of feeding decisions. Many of the practices in the Initiative can directly link with other quality and health promotion programmes. What hospitals say about the Baby Friendly Health Initiative in Ireland? A recent survey (March 2017) of directors of midwifery and clinical midwife specialists-breastfeeding across all 19 maternity units/hospitals found that the majority gave a rating of 90 or higher out of 100 for overall satisfaction with the Baby Friendly Health Initiative in Ireland (BFHI), with 88% rating all the services and supports from the BFHI in Ireland as very useful or useful. The full report including all the questions and responses, the Executive Summary and the response of the BFHI National Committee to the findings of the survey is available here.The Executive Summary of the survey report is here. Ireland’s involvement with the global BFHI commenced in April 1998. Maternity units/hospitals that participate in the Initiative are shown as a yellow dot on the map. Ten maternity units/hospitals have been externally assessed and met the BFHI criteria, though not all continued to meet the criteria and requirements. Those currently meeting the criteria are shown by name on the map. The Initiative was launched in 1991 and there are more than 20,000 hospitals/maternity units in 156 countries worldwide, including over 400 in Europe, that have been externally assessed and recognised as meeting the standards to be designated Baby Friendly. 2016 was the 25th Anniversary of the beginning of the UNICEF/WHO Global Baby Friendly Initiative. As part of marking this anniversary countries were asked to submit a case study of the BFHI in their country. Read Ireland's case study here. See our Programme Resources for more information on tools to assist with activities within the BFHI in Ireland. How does BFH in Ireland function? The Baby Friendly Health Initiative in Ireland aims to function with transparency, accountability and integrity. It is with deep regret that the National Committee of the Baby Friendly Health Initiative in Ireland (BFHI) announce that it is ceasing its activities. The Baby Friendly Health Initiative in Ireland has signed up to the national Governance Code for organisations working in the Community, Voluntary & Charity sector in Ireland and are on the journey towards being fully compliant with the Governance Code. What are the Challenges the maternity services in Ireland face in meeting and sustaining the standards of the Baby Friendly Initiative and achieving designation as a Baby Friendly Hospital? Read a 2014 report - have the challenges changed since then? The BFHI Coordinator, Dr Genevieve Becker, works part-time and is best contacted by email.